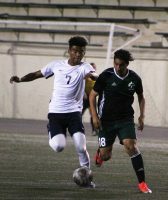 An overhead kick goal by El Camino College freshman midfielder Bryan Morales resulted in a men’s soccer loss on Friday with a final score of 3-2 at Weingart Stadium. The goal was scored in the last seconds of the added time when El Camino sophomore defender Cole Prince made a throw-in to the penalty box and Morales scored an overhead kick goal. “It was amazing. I’m really happy because it is the first time I scored a goal like this. It was in the last minute and I gave it all when I made the shot,” said Morales. Throughout the game, both teams showcased their offensive skills and created many opportunities to score. “It was a really tough game. I know coach Eddie Flores really well, and he gets his teams to play really good and today there was no difference. It was a game where both teams attacked each other and at the end we were able to win,” said El Camino head coach Mike Jacobson. After many attempts to score by East Los Angeles College, the first goal was made after freshman defender Eduardo Rosas sent a pass to the center of the penalty box where freshmen forward Pedro Moraes shot, but was was blocked by Prince, leaving sophomore forward Rene Sanchez to score. ELAC had the opportunity to increase the lead when freshmen midfielder Andres Aceves started a counter attack where he dribbled the ball 10 yards and passed it to freshman forward Paulo Macedo Nahashique, who was alone, and shot from inside the penalty box but missed. “I had many opportunities (to score), but the other team was good. Like I said, we need to continue to work because we have a very good team. Today was just not our day. We had no luck,” said Nahashique in Portuguese. When the regular time was about to end, a great play was made by freshman midfielder Jean-Pierre Dejean Macksa to tie the game. Macksa made a 360º spin between two defenders in the left side of the penalty box and passed the ball to the center, where freshman midfielder Stanley Torres scored. “It was unbelievable. We missed three opportunities that should’ve gone in. Unless we score goals, we are not going to win. We don’t have many forwards, and the ones we have, they missed goals. We paid the price. Those we forgive (goals) are the ones we receive,” said Huskies head coach Eddie Flores. With seven minutes in aggregated time, the best offense skills were showcased.The teams scored three goals. On a free kick for El Camino, freshman forward Kevin Negrete passed the ball to freshman defender Mason Briggs, who sent a center pass to the penalty mark, where Morales scored to increase the lead to 2-1. Two minutes later, on an error by El Camino goalkeeper in the penalty box, ELAC sophomore midfielder Jerson Maravilla took the ball and scored the tying goal to even the score 1-1. Maravilla was the most dangerous player on the Huskies’ attacks. He participated in most of the offensive attacks that the Huskies created in the first half. “I always try my best to help the team in the field. It is my passion (playing soccer) and is something I love to do. It comes from my heart to try to score all the time and asking for the ball all the time,” said Maravilla. When Maravilla tied the game, El Camino defender Mason Briggs got frustrated and ran for the ball inside the goal, but Silva grabbed it first. Briggs pushed him and tried to fight. The Huskies bench got upset. Moraes,who was on the sideline,got a red card for stepping onto the field. .
After yesterday loss against Long Beach City College, Huskies have a five-game losing streak. ELAC now stands 3-9-2 overall and 1-3 in the South Coast Conference-North conference. ELAC will play a non conference away game on Friday to Compton College at 2 p.m.